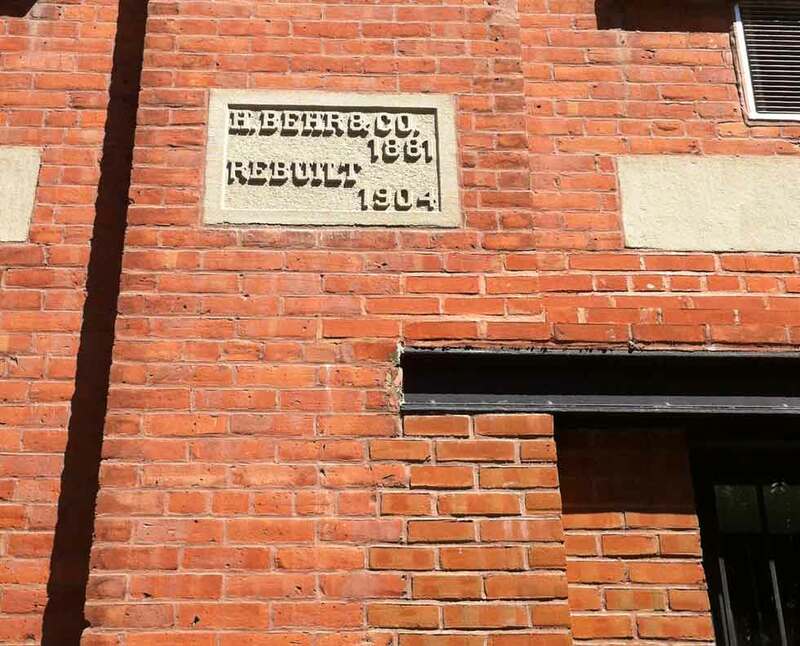 Directories locate H. Behr & Co., manufacturers of sandpaper, on Tiffany Place, Brooklyn in 1883. The 1881 date on this plaque may very well be correct. The 1904 date relates to a rebuilding that took place after a disastrous fire in 1903. As reported in the Brooklyn Daily Eagle, 9 Nov. 1903, p. 1, "A fire, which destroyed the major part of the factory of Herman Behr & Co., manufacturers of sand paper, glue and other products, broke out at about 12:20 o'clock this afternoon and destroyed property valued at from $80,000 to $100,000... The building is about 200 feet long and has its largest frontage on Tiffany place..."
The life and exploits of Herman Behr (1847-1934) were summarized in this article from the Brooklyn Daily Eagle, 6 Aug. 1922, p. 19, "There is nothing particularly romantic in the thought of sandpaper manufacturing, and yet the history of Herman Behr & Co., which celebrates its golden anniversary tomorrow, 50 years to the day from the time that Herman Behr, still the active head of the concern, started the manufacture of that very useful product in a little one-room shanty of a shop on Aug. 7, 1872, is a real industrial romance. The Behr Company's product is admittedly the finest in the market and is used as a standard. The man who is responsible in the greatest measure for this was born in Hamburg, Germany, in 1847, and came to this country with his father, a hardware merchant, when 3 years old. After leaving school, at the age of 14, he entered his father's shop, and while there became interested in the manufacture of "pouncing paper," used in the finishing of hats. During the first year of its existence Herman Behr & Co. consisted alone of Mr. Behr, who lived, ate and slept in his little shop, from which he moved into what he then considered spacious quarters on State st. Here he experienced the first thrill and satisfaction of using steam power, the main shaft, one and three-eighths inches in diameter, being placed into position with his own hands. He was one of the first large manufacturers in the city to recognize the value of a profit-sharing plan, and Gustav Heubach, office manager for several years previous was taken into the firm in 1884; in 1904 the superintendent of the plant, J. S. Frazee, was admitted to the firm, and is now vice president; and two of the present directors were employees of longs standing, A. J. Sidford and M. E. Pesnel. The celebration of the half-century mark in the company's career will take place on Sept. 23, when a 'family party' will be held at the factory. This date was set so that all the employees, many of whom are on vacations, will be present." A more complete article covering the Behr fiftieth anniversary appeared in The Furniture Manufacturer and Artisan, Sept. 1922, p. 117, reading in part, "On August 7 the firm of Herman Behr & Company, Inc., sandpaper manufacturers of Brooklyn, N.Y., celebrated the fiftieth anniversary of its founding... Shortly before 1872 he was in business as a glue jobber with his brother Henry. On August 7, 1872, becoming interested in the manufacture of a sandpaper now known as pouncing paper, for use in finishing hats, he entered that business. Mr. Behr was so interested in the possibilities in his new work that the first winter he actually slept in the back of his shop so as to lose no time in developing it. His little business grew and one year later he moved to State Street, Brooklyn, where he experienced the first thrill and satisfaction in the use of steam power, his main shaft being one and three-eighths inches in diameter, and placed in position with his own hands. Another brother, Robert Behr, became a member of the firm in 1878, and in 1884 Gustav Heubach, a brother-in-law, office manager for several years, also joined the firm. In 1904 J. S. Frazee, then superintendent of the plant, was admitted into the firm, and in 1911 the company, which had grown by that time to one of the leading houses in the industry, became a corporation under the laws of the state of New York, with the four original members of the firm as officers and directors. Since then Robert Behr has died, and two new officers and directors, A. J. Sidford and M. E. Pesnel, employes of long standing, have been identified with the management of the company. The plant today covers a floor space of four and a half acres at 31-63 Tiffany Place, Brooklyn, with nearly 300 employes in the organization. The company has branches in Chicago, Boston, St. Louis, San Francisco, Grand Rapids, Toronto and London and several agents abroad. During the fifty years of its existence, Herman Behr & Company have put several distinct innovations on the market. They made the first perfect pouncing paper in this country. They introduced the first garnet or red sand abrasive paper in the world. Later they made the first flexible cloth belts of abrasive and followed this with the first successful aluminous oxide coated cloth discs for metal grinding. The most recent advance in the improvement of sandpaper is marked by the invention in 1918 of Behr's Openkote process of putting sand on paper. ..."
Behr's obituary in the New York Times, 7 March 1934, p. 19, read, "Herman Behr, formerly one of the largest manufacturers of sandpaper in the United States, as president of Herman Behr & Co., died yesterday at his residence, 131 East Sixty-sixth Street, at the age of 86. He had been ill for a year and a half. Surviving are his widow, Mrs. Hedwig Bever Behr; four sons, Herman J., Frederick, Max and Karl, former member of the American Davis Cup tennis team, and two daughters, Mrs. A. M. Reid and Miss Gertrude Behr. Born in Hamburg, Germany, Mr. Behr was brought to this country as an infant by his parents. He founded the sandpaper business of his name and remained at the head of it until his retirement five years ago when it merged with the Manning Company of Troy, N. Y., to form the Behr-Manning Corporation. In a quiet way, known only to a limited circle, Mr. Behr had for many years been a patron of music and chess, which with literature, formed his chief interests outside of business. He composed the music for several songs. His family has long been associated with the life of Morristown, N.J., where he lived until a few years ago. He was a member of the Downtown Association and of several clubs in Morristown." In 1928 H. Behr & Co. merged with the Manning Abrasive Company of Troy, N. Y., to form the Behr-Manning Co. As explained by Charles W. Cheape in Family Firm to Modern Company: Norton Company, a New England Enterprise, 1985, "Old age and declining performance also triggered the major combination - the consolidation of the Herman Behr Company with the Manning Abrasive Company in 1928. Herman Behr was in his 80s and top personnel in sales and production had died. One of Behr's sons was a stockbroker and the other had little enthusiasm for the business. The Behr Company had failed to penetrate the new metal-working markets and was rapidly losing ground to the younger, more aggressive firms." This ad for Herman Behr & Co. appeared in The Wood-Worker, February 1923. The September, 1922, issue of The Wood-Worker featured a Behr ad for Openkote, a Behr sandpaper using garnet. Charles W. Cheape, again, in Family Firm to Modern Company: Norton Company, a New England Enterprise, 1985: "The substitution of sharper, harder electric furnace abrasives for natural grains permitted sparser coatings, which actually improved performance. The Behr Company discovered the process, which it called Openkote, when it accidentally shipped paper that had been sparsely coated with grain, covering only 50-75 percent of the paper. The paper proved surprisingly effective for sanding soft materials like wood and leather. Wider grain spaces reduced heat and clogging from oils, varnishes, and other soft particles and increased paper productivity two to five times. Behr refused to patent the process and it quickly became an industrywide technique." The Behr Mansion at 84 Pierrepont St. in Brooklyn Heights receives extensive attention on the internet. The AIA Guide to New York City, 5th edition, 2010, gives the following, "Originally Herman Behr House / later Palm Hotel / later Franciscan House of Studies / now a residential condominium. SW cor. Henry St. 1889. Frank Freeman. After Behr, this mansion had a profane and then sacred existence prior to being converted in 1977 into apartments. In the Palm Hotel's declining years it was said to have housed the local madam and her lovelies. It then served as a residence for Franciscan brothers. Despite the structure's social vagaries, Freeman's design remains a distinguished monument on the Heights streetscape. The fa�ade, recently cleaned and restored, adds new sparkle to this prominent corner."